Each of the objects in the ANA’s Edward C. Rochette Money Museum collection has a unique story. 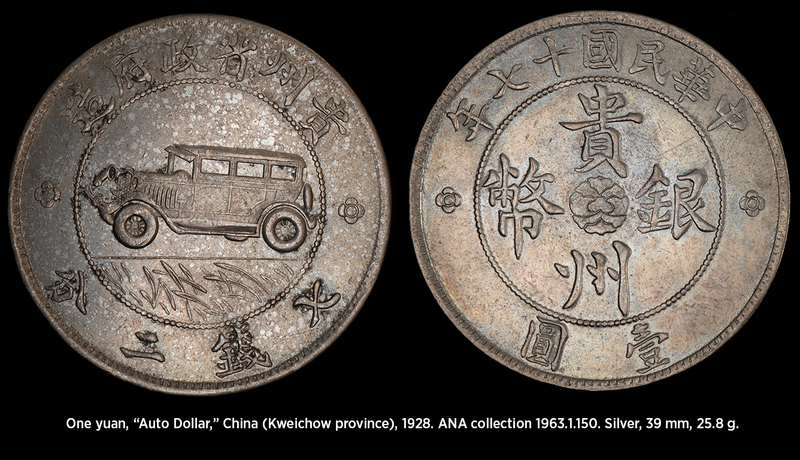 One intriguing tale involves the 1928 “Auto Dollar.” This rare and historic piece was produced at a chaotic time in China’s history, and holds the distinction of being the first coin to feature an automobile as a main device. 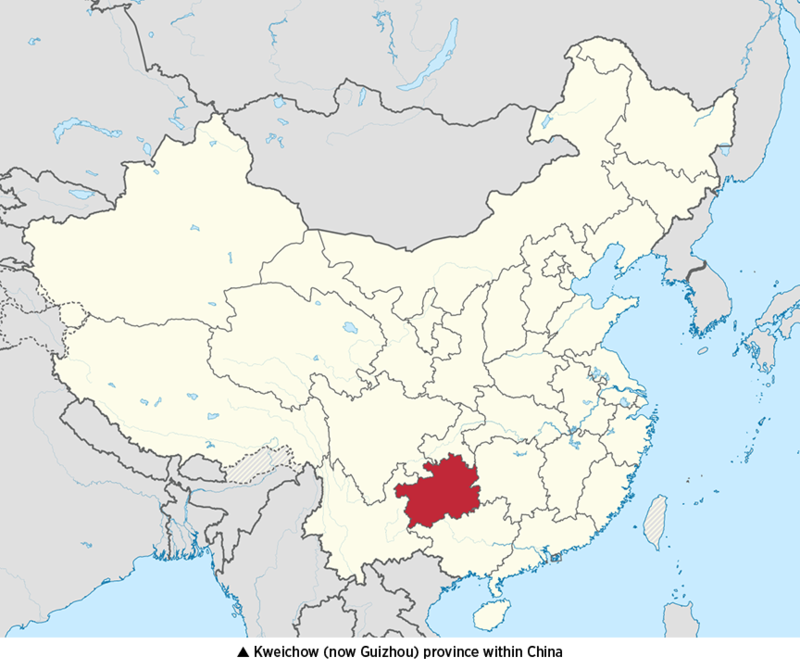 The Republic of China (1912-49), which comprised all of China plus several other present-day countries, was a vast and complicated place. 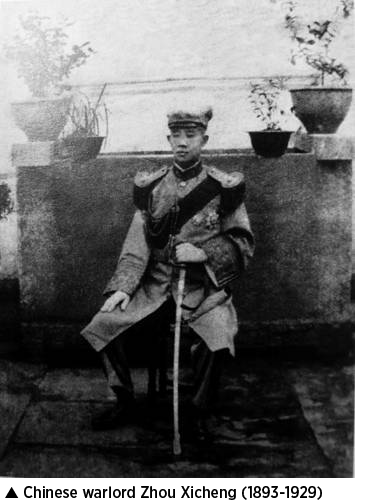 The last imperial dynasty, the Qing (1644-1912), was overthrown, and the republican government and the Kuomintang (Nationalist Party of China) wrestled for power. This instability signaled the rise of regional warlords, who reaped power through intimidation and force. One of these men was former Republic of China army brigadier Zhou Xicheng (1893-1929), who controlled the south-central Chinese province of Kweichow (modern-day Guizhou) from 1927 to 1929. He made efforts to modernize the province, but had a reputation for extravagant living. Zhou had a passion for something that, at the time, most Chinese people could not attain: automobiles. Since few roads existed in central China, the leader was unable to quench his thirst for driving. Zhou’s solution was to build a road, which eventually came to be known as the Kweichow Provincial Highway. Costing substantial time and money, it was an impressive accomplishment, and became the only road in the region on which one could drive great distances at high speeds. Its completion obviously was good news for Zhou, who previously had purchased an automobile in the United States (a large touring car, likely a Packard, Plymouth or Buick), had it taken apart, shipped to China and reassembled. It might have been the only vehicle in Kweichow. Naturally, Zhou wanted to celebrate his achievement and decided to commemorate the highway on a silver yuan. The original design featured the warlord’s car along with his portrait, but advisors convinced him that his image on the coin would upset many, and would possibly result in his overthrow or assassination. The updated and final motif depicts Zhou’s car (or a slight variation) with a Chinese legend reading “Made by the Kweichow Government” above and the denomination “Seven Mace and Two Candareens” (1 yuan, the base unit of Chinese money) below. 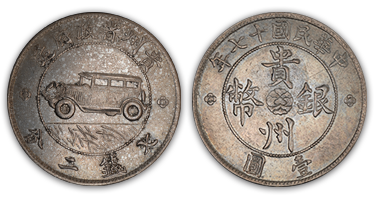 The reverse features a poppy with the legend “Kweichow Silver Coin,” “Seventeenth Year of the Republic of China” (1928) and “One Yuan.” For many years, it was the first and only coin to feature an automobile as a main device. Although Zhou agreed not to put his portrait on the piece, he insisted that his name be included discreetly in the grass on the obverse below. Zhou attained some popularity for building roads and other public works, but his rule came to a violent, predictable and ironic end. 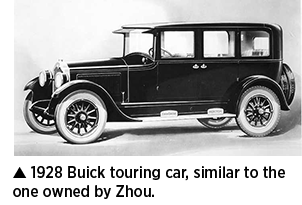 In May 1929 he was driving his beloved car while leading troops down the highway he built. Somehow, Zhou became separated from his men, and a rival warlord’s troops ambushed him. He tried to escape, but was shot and left to die by the side of the road, most likely in the grass represented on his coin. About 648,000 Auto Dollars were produced, but it is unclear where they were struck, as Kweichow probably did not have a mint. The ANA’s specimen is graded Mint State-61 by Numismatic Guaranty Corporation. Moritz Wormser, ANA president from 1921 to 1926, acquired the coin in 1930 and donated it to the ANA collection, then housed at the Smithsonian Institution in Washington, D.C.
Click on the image below for an enhanced view. I will probably read that twice. Simple because is so good. Great blog and pictures. Now that is a story of a coin that has everything behind it: country, passion, oppression, history, etc.